PUNKS LINE UP FOR MENTAL HEALTH! 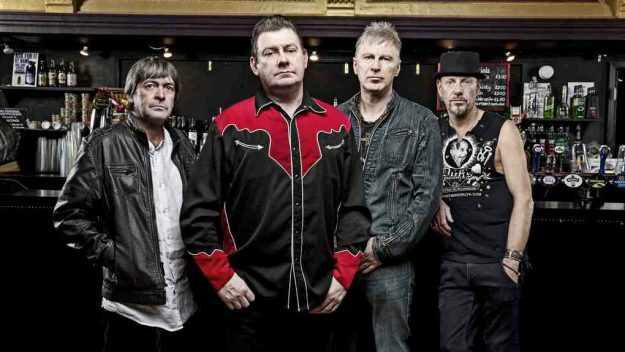 STIFF LITTLE FINGERS head a line-up of punk bands contributing to a new compilation album raising money for people with mental health problems. Proceeds from the 16-track Top Of The Punks Volume 1 album will go to mental health charity Mind. Other acts contributing tracks to the project include ANGELIC UPSTARTS, THE DEFECTS, THE FILAMENTS, KNOCK OFF, SUBCULTURE, RT-ZED, 5 GO MAD, APPLE SHIFT SEVEN, WRECK-AGE, WAKE THE CITY, BORN TO DESTRUCT, JOHNNY & THE MENTAL BREAKDOWNS, HAZARD, UK VOMIT and SPRING PARK. The specially designed album artwork emulates the the classic Top Of The Pops compilation series of the 70s. Set for release on 17 June, the album will receive a special live launch at The Bear, Northampton that night. Confirmed acts appearing are Subculture, 5 Go Mad, Jonny & The Mental Breakdowns, Apple Shift Seven, Wreck-Age, Wake The City, Born To Destruct, Spring Park and UK Vomit. Admission is £5 on the night. The album is available as a CD limited to 400 copies and download. It’s available to pre-order here. I’ve also attached an image of my logo to this email. You could upload this to accompany the above text if possible. If there is a responsible person in your organisation who can add this link, may I ask you perhaps send this email on? ‹ PUNK GOES TO DEVON!